Head of Government of Georgia stressed the significance of the visit to Brussels as teachers had an opportunity to get exposed to the structure and principles of operation at the North Atlantic Treaty Alliance (NATO) and European Union (EU). They also obtained information on the European and Euro-Atlantic integration of Georgia. "European and Euro-Atlantic integration is our key aspiration. Our goal is to return to our common European family. Hence, your visit is both symbolic and enriched with substance, as you had an opportunity to feel the attitudes of Europeans towards Georgia yourself" added the Prime Minister of Georgia. Head of Government of Georgia focused on the role of teachers in the upbringing of future generations and expressed special gratitude to them for the efforts made towards this end. Teachers from Pankisi shared their experience with the Prime Minister of Georgia and thanked him for the support demonstrated towards the project, which was implemented for greater exposure and public awareness about the EU and NATO. Meeting was followed with an award of Certificates of Excellence of participation in the Project for Increased Public Awareness of Teachers from Pankisi Valley on European and Euro-Atlantic Integration of Georgia. Study Tour of a group of 20 school principals and teachers from Pankisi Valley to Brussels was held on February 3-7, 2019. 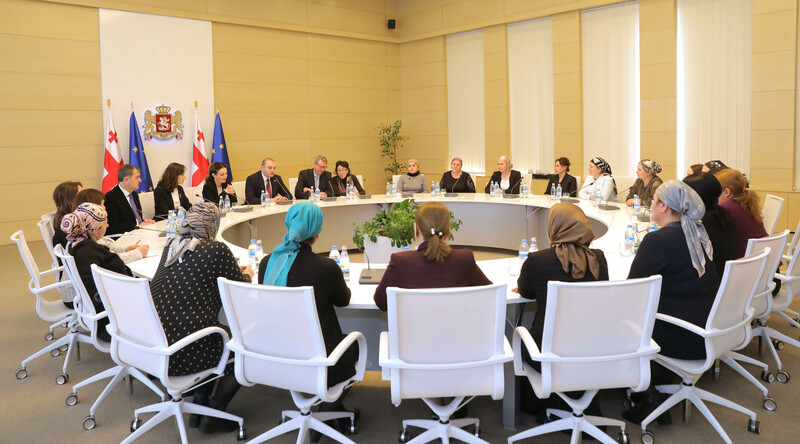 Meetings were held at the EU and NATO Headquarters, education institutions of Belgium and local education system officials within the scope of the visit to share European experience in the area of common interest. Project was implemented by the Office of the State Minister of Georgia for Reconciliation and Civil Equality, along with the NATO and EU Information Centre in collaboration with Ministries of Education, Science, Culture, Sports and Foreign Affairs of Georgia. Project is supported by the EU Delegation in Georgia.